First Sentence: He looked over the dash of the new ford Taurus, already littered with PowerBar wrappers, thanks to his partner. Reason for Reading: I was curious about James O. Born’s novels and when I saw this one among the books available for review through Curled Up With a Good Book, I couldn’t resist requesting the copy. This is my first selection for the Summer Mystery Reading Challenge (Liz, the hostess, said participants could get a head start on this one, and so I took advantage of her offer). Comments: What better way to begin summer than with a novel full of mystery and intrigue? 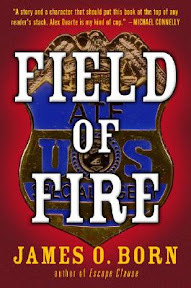 Field of Fire is a good place to start. Stepping outside of his Bill Tasker series, author James O. Born presents a new protagonist, Alex Duarte, a special agent with the Alcohol, Tobacco, Firearms and Explosives Agency, otherwise known as ATF. Alex walks the straight path, intent on doing good and seeking justice. He is hardworking and ambitious, wanting to move up in the department. He earned his name “Rocket” because of his focus and determination once he is set on a task. When the man Alex recently arrested proves to be the intended target of a bombing that killed innocent people, including a young boy, Alex is pulled into a complex investigation involving the assistant attorney general's office. Alberto Salez had been picked up on gun charges. He agreed to help the ATF uncover the identity of the possible bomber only to escape from custody himself. Now on the run for his life and from the authorities, Alberto Salez will stop at nothing to stay one step ahead. Alex is determined to track down the man he let get away. However, Department of Justice attorney, Caren Larson, has been assigned to work with Alex to help her with her own investigation, that involving the bombing at the labor camp as well as two other related bombings and murders believed to be the result of labor union disputes. Trying to catch Salez's trail and uncovering the motive and identity of the bomber are first on Alex's agenda. Attorney Caren Larson is an enigma to Alex. She is smart and beautiful. They make a good team, and seemingly balance each other out. However, Alex is not completely sure what part Caren plays in the investigation and what her motives are. As the investigation continues, the more tangled the web appears to be. Is everything as it seems or is there more to what is going on? Alex is determined to get to the truth. The novel follows the movements of three main characters throughout the novel, that of Alex and his investigation, the hired killer as he continues to hunt down the designated victims and Salez's flight for survival. With each perspective, the layers of the mystery are revealed and the intensity builds, coming to a dramatic climax at the end. Within the framework of the story, the author deftly explores the personal side of his characters, offering insight and depth into their lives, exploring their weaknesses and vulnerabilities. The author subtly weaves in social issues, including that of race and ethnicity and the struggles a war veteran may have in coming to terms with his past. Alex Duarte may seem too good to be true upon first glance, but once you get to know the guy, he’s not only likeable but he’s admirable. Haunted by his experience in Bosnia, not trusting his own ability to read people and his confidence and pride in the work he does only add to his charm. He’s a man of action, whose honesty and dedication make him stand out. Favorite Part: As confident as Alex is doing his job, his lack of confidence in his social skills was endearing. My favorite scene was when Alex and Caren faced the men outside of the bar. I could just see that scene played out in a movie.